At first I was amazed at how quickly I became tired, My balance, which had never been brilliant, was totally non existent, My first aim was to walk around the Recreation Ground, immediately behind our house. This was a couple of weeks after being discharged from hospital. It's not far around the Rec, half a mile at most. At the first attempt, I cheated and cut across the narrow bit in the centre. On the far side there is a cycle track with humps, bumps and steeply banked corners. Initially, this defeated me completely, even on foot. A depressing start, but the very next day I got round the whole Rec and walked the cycle track. For me, things improved very quickly, but it was clear that I couldn't over extend myself. The next challenged was to become useful - rather than simply a recovering invalid. The shops in Harelston aren't that much further than circumnavigating the Rec, But I had to limit the amount of shopping. After 4 weeks, I could go to the shops provided I wasn't daft about the amount I carried. One of the oddities though was that I wobbled. I was like falling of the edge of a kerb where no kerb existed. Bryony and I have always enjoyed walking and I was determined to expand my ability to handle longer walks as soon as possible. When we had Tatty (our Jack Russell Terrier/Lhasa Apso cross), her regular was along country paths and tracks to the next village Starston. A month had passed and I felt ready to attempt this. This is pretty gentle walking. We are out of the town envelop within half a mile. The road (Bunn's Lane) running east - west from the edge of town has been converted into a path along which bicycles are also permitted. It runs in between farmland. The large field to the north was, until very recently, cultivated as a rose nursery. The flowering seasons for the various cultivars was extraordinarily long. My path turned along the eastern edge of this field until is crossed the old railway line from the Pulhans and Norwich. This is one of the legacies of the Beeching cuts. So many of our old railways ran through pristine country. We go onward towards a stand of firs destined for Christmas trees, but not for many years. There is a gentle slope down to the road to the Pulhams and the Beck. The road crosses the stream and to the hamlet of Starston, but we stay on the south side. This is an unenclosed meadow. It is not cultivated in the true sense of the word, but the farmer does take a hay crop a couple of times a year. It is, however, subject to fairly frequent flooding. The tractor wheels leave deep and irregular ruts on the ground. It was pretty wet on this first assay after my stroke, Given that my balance was fairly hopeless, I was lucky to get through this bit without falling over. Turning north, we reach the old railway line again and follow it until reaching a small lane from Startson. This lane takes us back to the far end of Bunn's Lane. At this end of the lane, there is always lots of fairly deep barking. There are at least three dogs involved but I've never been brave enough to take a look. From here, I would guess it's just under a mile back home. The whole route took considerably longer than an hour. Before, even when walking the ever inquisitive Tatty, it took much less time than that. Still it was a start. Even though I'm generally lazy, it never occurred to me that I couldn't walk 7/10 miles if I wanted. After all I had walked from the top to the bottom of the Grand Canyon aged 11 (about 16 miles). Admittedly it was half a century earlier, but that confidence was well and truly shattered. I needed to test my walking stamina again and soon. This was certainly a challenge. I estimated that it was just over 7 miles. This part of Norfolk isn't entirely flat, but most of the slopes are short and gentle. I wasn't going to be challenged by steep gradients. I started with the short walk through the town. Harleston is quite old. There are many passages and footpaths that allow one to avoid most of the main roads. Over the bypass the countryside proper begins, The footpaths wriggle around the edges of fields towards Redenhall. Curiously, our parish is called Redenhall with Harleston. Clearly, when the parish was named, Redenhall was by far the more important of the two and appears in the Domesday Book, It certainly has a much more beautiful parish church, but Redenhall itself is barely more than a hamlet. The church is used for concerts as well as the traditional religious services. Harleston, though, seems to have always been the commercial centre, It has been a market town since at least 1369. The Market Place remains functional. Bullock Fair is an open car park and Budgens supermarket.. There is also a designated common, though this is somewhat distant from the town centre. I'll pass the common towards the end of this walk. Through Redenhall and my route re-crosses the A143 (Bury St Edmunds to Great Yarmouth road). This is the start of a period through very gently rolling country, The Gawdy Hall Estate lies immediately to the north of my route for a couple of miles. I then meet the backroad into Harleston, but walk away from the town towards Startson. Starston is tiny (like Redenhall) but its residents seem to be much more active. The local estates office premises have been converted into an a business community. The parish church is very active and the local residents have acquired some acreage adjacent to the Beck as a play area community resource. My route, though, turns north, to Skinner's Lane which leads to a couple of farms and associated cottages. This is a major deviation and adds significantly to the length of the walk. 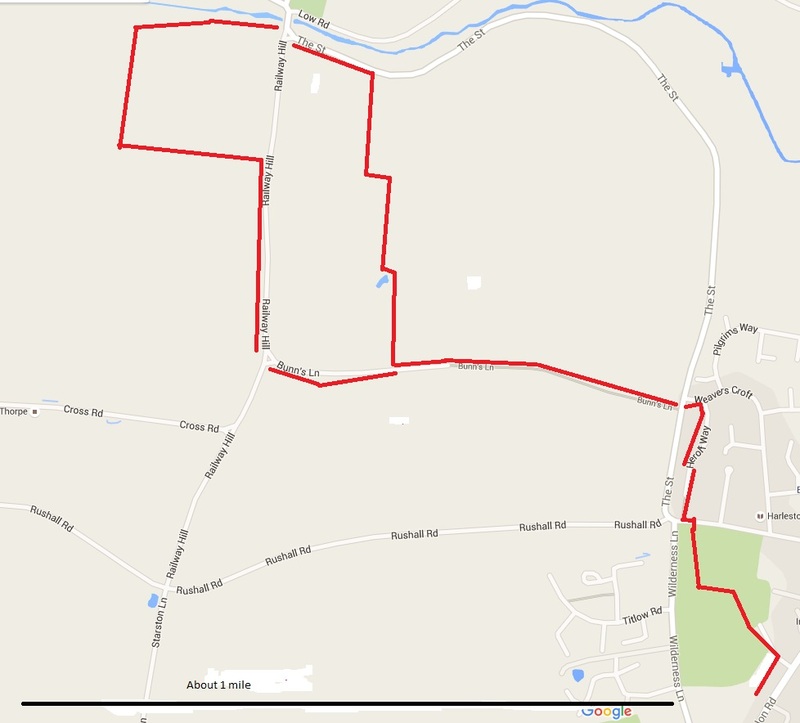 The route here forms three sides of a rectangle eventually crossing the back road between Harleston and the Pulhams. Over the road and through the inevitable chicken sheds (they spring up everywhere) I cross the Beck bearing towards Harleston. But not before going through a farmyard with much barking from highly excitable dogs. I had chosen my route carefully so as to extend the walk without running myself completely into the ground. Nevertheless, I had forgotten the narrow log bridge I had to negotiate. I was tired and a recurrence of the lurch seemed inevitable. I braced myself at one end, then made the 8 feet across without mishap. I return to Harleston proper via the Common. These days it is no more than a small triangle grass and a few trees. From here to the Recreation Ground and home is but a few minutes. I was exhausted but pleased. My annual holiday with Patrick (my eldest son) at the Walbersick caravan site was assured. I had enough energy and stamina to enjoy the pub, the harbour and the reed beds. Somehow it did not seem likely that I'd brave the sea. My father, Cla, was a fairly high-flyer (Perren Professor ofAstronomy, UCL; Astrophysical Quantities). But he suffered a pulmonary embolism just before he retired back to Canberra. Initially, Cla had an office at the Mt Stromlo Solar Observatory, where had originally worked in the 1930s and 40s. This helped him finish the 3rd edition of Astrophysical Quantities, 1973. After that he was left much to his own devices for intellectual activity. Bryony and I visited Rose (my mother) and Cla in 1977/78. He had written up his experiences of “Hiking in Early Canberra”. Bryony and I had tried to get bookshops in Canberra to take copies. Our sales pitch was not hugely successful. Cla was still interested in bird song and had devised a notation for writing down bird calls. He had also devised a bell tune for the Canberra Carillon. Nevertheless it clear, even then, that Cla’s attention span was dwindling. His attempts to teach Bryony to drive in Canberra were a near disaster. Rose and Cla visited us in England a couple of years later. Meredith was 15 months and quite adorable. Family panic set in while picnicking at Greenwich Park. Cla had taken Meredith to see The Cutty Sark, without telling us. Thankfully Cla returned with his granddaughter without incident. But Alzheimer’s syndrome had clearly taken hold. Cla died in 1987. Rose survived Cla by nearly 25 years. She was a vehemently independent soul and lived on her own the whole time. All my life, I remember her attending adult education classes, but she seemed to graduate into giving lectures to her classes after Cla had died. She continued to give lectures until about a year before her own death. Indeed the family was alerted her passing by a colleague, who had called to take Rose to one of her literature classes and could not raise her. My elder brothers, Clabon, Bryden and Russell, each have their own methods of keeping both mentally and physically active. I confess that in each case their choices of mental stimulation seem mildly eccentric, but that does not seem to matter. Indeed, I wonder whether Bryden’s accident 15 years ago has enhanced his eccentricity. You may be interested to go to his web page and see for yourself. Significance for me is that Cla had suffered a major medical condition. Could this have predisposed him to changes in brain activity resulting in Alzheimer’s syndrome? If so, was there anyway that he could have staved off the loss of brain function? In my own medical condition the brain itself has been damaged. The long term effect of this is a matter of guesswork. Taking Rose, my elder bothers as examples, staying both mentally and physically active is a sensible way forward. This blog records my attempts at staying active, not least intellectually. Bryony and I walk most mornings as part of a get fitter regime. 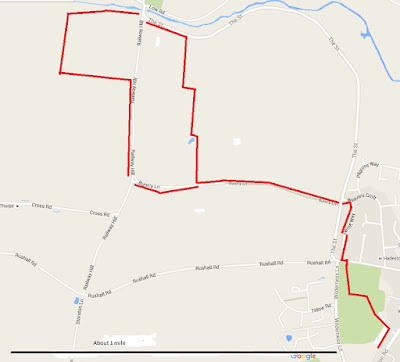 The idea is to walk fairly briskly for about 2½ miles along roads or made up footpaths. (In fact measuring the distance on the local OS map suggests a distance of just over 3 miles, Given that it takes us around 50 minutes that makes our walking speed a bit more respectable. - SWA 28/5/2016) So there is no excuse to slow up for streams with log bridges or barbed wire fences. On the other hand, stopping to get out of the way of passing vehicles is permitted. This morning, though, Bryony was on duty with the grandchildren in Forest Hill. Our route takes us along a narrow country lane up a mild incline with high banks on each side. There were the usual interruptions to allow cars to pass. Towards the top I spotted a cyclist walking a dog. Bryony and I had seen this pair on previous occasions. Usually, the woman, fully togged out with helmet, high visibility jacket etc., is cycling very slowly with the dog trotting alongside on a lead. The dog is a miniature or toy of some description; probably a probably a Yorkshire Terrier or something similar. This morning, to my astonishment, both cyclist and dog were walking. Why? They were heading downhill. If safety was an issue, because of the narrow lane, the dog could easily have been placed in her front basket. The whole incongruity of it tickled my fancy. I’m a retired, none too successful, consultant/software developer (ACBA in Retirement http://www.acba.co.uk/). Grown up children and grandchildren (plus a little study) keep me busy. Also, I like food and Bryony, my wife, is an excellent cook. We have both succumbed to weight gain, but not grossly so. Walking in our local countryside is very pleasant, but this activity has not been enough to counteract the effects of eating too much. The first few months were the worst. Inevitably, the focus of all my attention was on me. The initial impact of the stroke was right-sided paralysis. Not total paralysis rather a numbness from head to toe. It was most obviously visible by the lop-sidedness of my facial features. The NHS provided excellent immediate aftercare and information. This included 6 weeks’ worth of nursing support at home. Even more support and advice is available from the UK’s Stroke Association. But recovery is very individual. You have to do it for yourself. I was encouraged to undertake specific technical exercises to improve my ability to handle normal everyday skills. These were dutifully, if not enthusiastically, completed. The stroke had interrupted a 1st year Open University course in Networks, Linux Operating Systems and Robotics (Technologies in Practice). Continuing and completing that course had by far the greater priority. Surprisingly, I was able to handle this without too much stress. The course did not require an end of year examination and made life for the recovering stroke patient much easier. So my brain was not completely mashed, but it was clear that I had to work progressively in order to re-establish stamina. The right-sided numbness faded after 4 or 5 weeks. That is to say, I wasn’t aware of it all the time. In reality, the effects of it were still there. I began walking outside within a couple of weeks, but not far. Fortunately, our house backs onto the Harleston Recreation Gound. My first attempt at circumnavigating it, after about three weeks, left me completely exhausted. In these early stages, though, things improved very rapidly. I was going to the shops and carrying light loads home (½ to ¾ mile) in less than another week. Clear signs of improvement were very encouraging. In a further month or so, I had managed a walk of about 6/7 miles. Originally, Patrick (my eldest son) and I had been planning a cycling holiday in late June. That was out of the question, but we returned to our usual holiday caravan in Walberswick. I proved to myself that the extended walks were not just a fluke. Everything seemed to be progressing nicely. Playing any musical instrument involves, I suspect, very different parts of the brain. I picked up the violin for the first time after about 4 weeks. To my astonishment, the loss of facility was not huge. In fact, my sight reading appeared to have improved. Was this because I was doing everything that little bit slower? I coped with a concert with Waveney Sinfonia at the beginning of May reasonably well. The larger viola took a while longer to get used to, but the members of my regular quartet were very patient with me. Life seemed be getting back to “normal” very nicely. But was it? This is a blog about getting back to "normal" after a stroke. It is only 15 months since my stroke, which, thankfully, was quite mild. The first indications that I was susceptible came 3/4 years ago when I had a couple of TIA episodes. A Transient Ischemic Attack (TIA) is often called a mini stroke but, unlike a stroke, it does not result in permanent brain damage. The thought of permanent brain damage sounds incredibly scary, but our brains are phenomenally adaptable. The brain, it seems, is clever enough to re-learn things even when it has lost one part of its functionality, but the patient has got to give it the space and time to undertake the relearning. This blog is about my experiences re-learning those things which I had thought were a permanent part of living. It covers walking, playing musical instruments (violin, viola, piano), driving, academic study and, most recently, cycling. Each activity presents its own challenges. I also now know that the process of re-learning is continuous.